Galapagos Islands travel – my dream itinerary. This is a sponsored post in collaboration with Lottoland. What is your lotto win holiday? Your dream vacation? Your trip of a lifetime? Basically, if money was no object, where would you travel? If you’ve read the ‘About Me’ page of this blog, you’ll know that my top three wish list destinations are Alaska, Cuba and Chernobyl. However, when I was asked to collaborate with Lottoland for this post, I wanted to put together my ultimate, no expense spared dream lotto-win trip. And whilst you’ll know by now that I am a thrifty traveller and a penny pinching pro when it comes to seeing the world on a budget, and I certainly don’t believe that you need a lotto win to travel, having an unlimited budget does afford you to travel in a bit more luxury and comfort. Charles Darwin is a hero of mine. Ever since I read about his expedition to the Galapagos Islands I have wanted to explore them for myself. I want to see the great creatures that inspired On the Origin of Species. I want to see the species that inspired the Theory of Evolution by Natural Selection. The Galapagos Islands are a chain of small volcanic isles in the eastern Pacific Ocean 973km (605 miles) off the coast of Ecuador in South America. The islands rank among the world’s most distinctive and abundant wildlife destinations. There’s over 9,000 species living here and in the surrounding waters. Just three per cent of the land is inhabited. A massive 97 per cent is protected as a national park, including 27,000 square miles of marine reserves. The Galapagos Islands, to me, are magical, mythical and mysterious and I don’t personally know anyone who has been. Travelling around the Galapagos Islands would be my dream adventure and what follows would be my ideal itinerary. Firstly, I am going to splash out on some fancy new luggage. Something like this 4-Wheel Falabella Travel Suitcase and matching bag by Stella McCartney. Then I am going to book a Rolls-Royce to bring me to the airport. I will settle down into my roomy and comfortable first-class seat on-board a flight to JFK airport. I know I could rent a private plane but to be honest I really love the whole airport experience and flying commercial, plus, I’d want everybody to see me in my first-class seat! It has always been my dream to fly first class but I am yet to do it. From JFK, I’ll take a helicopter ride into Manhattan then a Maybach to The Mark Hotel where I will stay in the Penthouse Suite for a few nights. Back to JFK, I’ll charter a private jet to fly me to Baltra Airport in the Galapagos Islands and then I’ll transfer to Santa Cruz Island and spend a few nights in the Pikaia Lodge eco-resort. 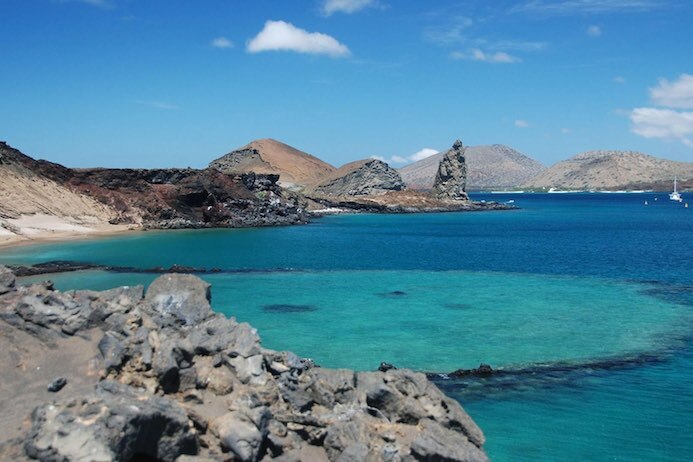 From here, I will join a luxury diving live-aboard yacht and spend at least 14 days at sea diving, snorkelling, kayaking and sailing around the Galapagos archipelago. I will swim with, sea lions, sea snakes, and 21 different species of shark. I’ll look out for Darwin’s finches, frigatebirds, blue-footed boobies, flightless cormorants and the waved albatross. I’ll try to spot the colourful Sally lightfoot crabs and the Galápagos land iguana, marine iguana and Galápagos giant tortoise. 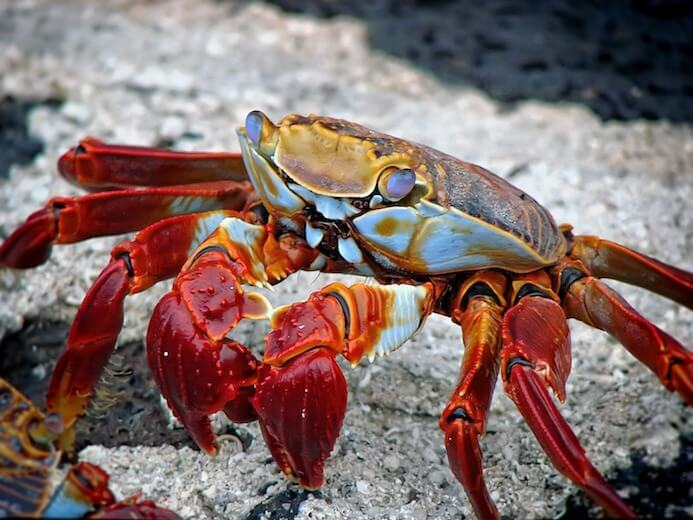 Did you know that these nine animals are endemic species of the Galapagos Islands? 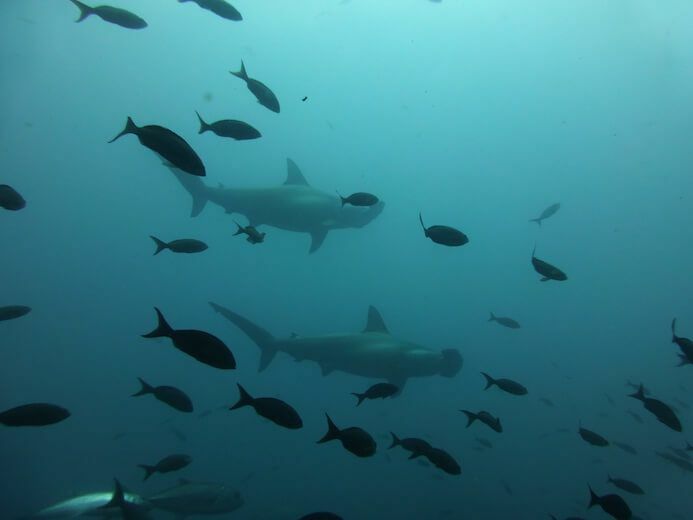 Another thrill for divers, is that at least 58 species of elasmobranch have been recorded in Galapagos waters, including 33 species of shark, 19 species of ray, four skates and two chimeras. In fact, hammerhead sharks are your constant dive buddies! How magical is that? After two weeks at sea, I’ll head back to Santa Cruz Island and spend a few days relaxing in the Finch Bay Hotel. I’ll then fly back to New York on another private jet. This time, I’d spend a few nights in the Plaza Hotel, hopefully in the same room that Robert Redford and Jane Fonda stayed in from my all-time favourite New York movie, Barefoot in the Park. I’d then take another Rolls-Royce followed by a helicopter ride back to JFK to fly first class back to Dublin. Oh who am I kidding? I wouldn’t fly home if I won the lottery. I’d just book another plane ticket and head off on another adventure. If you won the lottery, where would you go? Do you have any Galapagos Islands travel goals like mine? If you liked this travel post, you may also like my Cologne city guide. You might also like my Madrid food and drink guide to eat like a local in the Spanish capital. If you are going to Barcelona, check out my favourite thing to do in the city – La Boqueria food market Barcelona. For travel inspiration around Ireland, have a look at my Munster Vales Ireland travel guide. 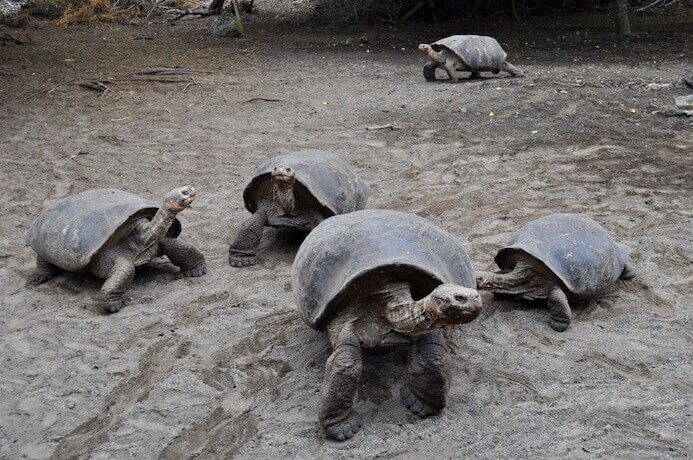 If you like this Galapagos Islands travel post, please share with others. All images sourced from Pixabay. 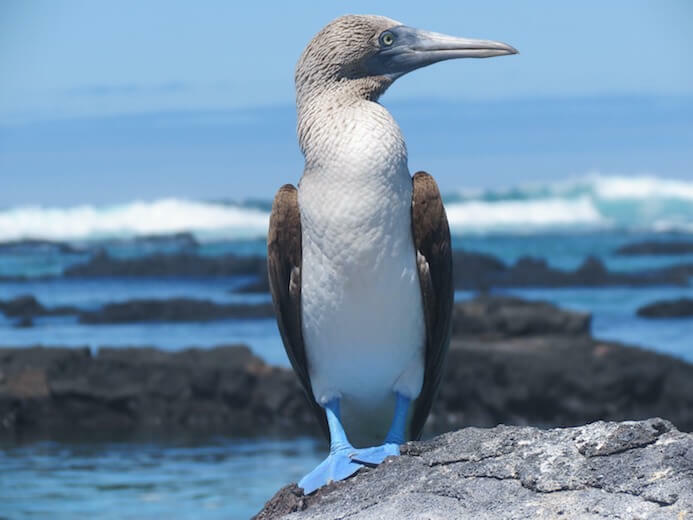 What a beautiful nature and wild animals to see at Galapagos Island! I heard lot about the island now it’s definitely on my travel bucketlist! There are so many creatures unique to the islands. It is a wildlife lover’s paradise. The Galapogos Islands are on my Dream trip list too – the sheer beauty and the flora and fauna there would be wonderful to see! Well, if you get to visit them before me be sure to let me know! I don’t know anyone who has gone yet. Well, not anyone personally. That definitely sounds like a dream trip! I would love to go there someday, too. It sounds like heaven on earth. It really does sound wonderful, doesn’t it? There are so many places I want to visit and the Galapagos Islands would definitely be a dream come true. I’m dreaming of warm breezes and beautiful island views. Yes! This winter has dragged on too long. A warm breeze and dip in the sea is most needed. If I won and could only use the money for traveling, well we would start here in the states and travel for a year. Never been to the Galapagos Islands looks beautiful. I would love to travel the States. It has been a dream of mine for years to see all of the States. Oh yes, first class all the way! Shoot you have lined up this trip to the Galapagos Island so well that I just need to go with you. Bora-Bora is a dream trip for me. Oh yes! Bora-Bora looks amazing. Definitely a dream trip. There are just so many places I want to visit! This is for sure a dream trip! I would love to get to go on an adventure like this! Now that our kids are a little older we hope to begin traveling a lot more. This would be a perfect place to escape without the kids. They’d never find you here! If I won the lottery I would go on a cruise around Italy and the Greek Islands. I would love to go to the “turtle” island. Oh the Greek islands are wonderful. I would love to do that too. If I won the lottery, I would definitely travel the world and this island will be included in my itinerary! It’s so beautiful and amazing. Definitely a must see. I would travel the world too! That would be my dream. I have heard that the Galapagos are incredible. I’d like to see so many places,the world is my travel bucket list. I love that the world is your travel bucket list! I’m gonna steal that one! I would love to see the Galápagos Islands. So much amazing biodiversity in one place. Yes, there really is. So many species there that you can’t see anywhere else in the world. Galapagos would be an amazing trip! Would be so cool to see all of the different animals there – really like the picture of that blue-footed boobie. Hopefully one day. If we won the lottery, we would travel indefinitely to every country, but still do so humbly and slowly without anything fancy! Oh that would be my dream too! I travelled for five years and did so very slowly as I really wanted to get to know the places. I slept in a hammock and camped most places too. I spent very little time in hotels. The Galapagos is my dream vacation! I love all of the see creatures there! So many people say it is their dream vacation. We should all get together and go and tick it off our bucket lists! The galapagos islands would be my ideal vacation spot. I’m putting it on my bucket list! Hopefully you’ll get to go one day and tick it off your bucket list! Seeing that beautiful crab jolted out some childhood memories in me. I grew up in an island and I surely miss it. Galapagos is one beautiful place! Oh how lovely. What island did you grow up on? I have always wanted to see the Galapagos Islands. I am a huge wilderness buff. I’m a wilderness buff too! I love the outdoors but don’t seem to get out to enjoy it much any more. A trip like this would surely make up for that. The Galapagos Islands truly look like a dream! We love wildlife and seeing these beauties up close would be amazing. My travel goals are Paris and New Zealand…but I’m open to anywhere beautiful! Oh I have only been to Paris once and I loved it and have to go back to explore more soon. I live in New Zealand for nine months and travelled around both Islands extensively. It is a marvellous country. You’d love it. 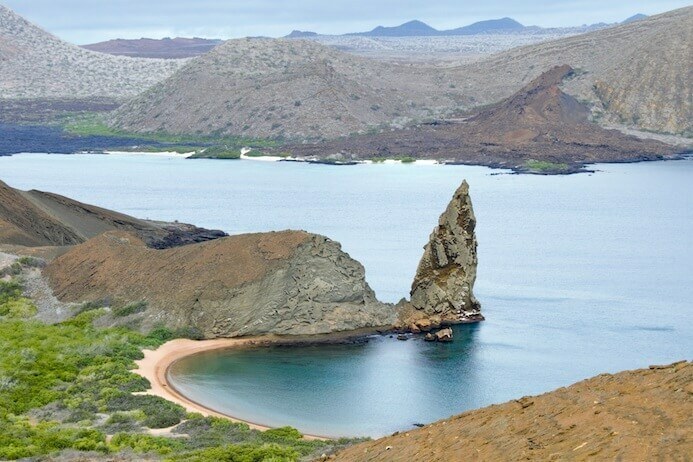 Galapagos Island is indeed the stuff that dreams are made of, t is such an exotic place. I would love to visit for the great bio-diversity of the place. It’s just so mysterious too. But the biodiversity is the big draw for me. I’ve not heard much about the Galapagos Islands before. I didn’t realize what all I was missing by not visiting. It would be a great place to vacation with kids too. Oh I think this would be a fantastic trip for kids. They would learn so much and get so much exercise and fresh air.